Battlefield V is on the way, and DICE is taking the franchise in a bold new direction. This time, instead of exploring modern warfare or visiting another oft-ignored military conflict, DICE is returning to the series' roots with World War II. But Battlefield V isn't just a return to the past. It's also pushing the series in entirely new directions. Directions that are sure to appeal to players new and old alike. The OP was invited to Battlefield V's closed alpha this week, which focused on the Arctic Fjord map across Conquest mode and Grand Operations. The former should be familiar to anyone who has played a Battlefield game before—two teams face off against one another for control points dotted along a map—whereas Grand Operations is BFV's take on Operations from Battlefield 1. In the closed alpha, Grand Operations split 64 players between two teams, the British and the Germans. From there, players embarked on a two-day-long Rush match across Arctic Fjord: One during the night, the other during the day. The mode starts with British paratroopers dropping down from the sky and assaulting the German Wehrmacht's artillery guns. After the first day ends, any survivor tickets left over from the initial fight are transferred over as the attackers try to capture outposts to finish their assault. But it's not the game modes themselves that make Battlefield V stand out. Rather, it's what DICE is doing with Battlefield's combat. This time around, there's a bigger emphasis on teamwork, class expertise, and situational awareness during fights, which makes for a much more engaging multiplayer shooter experience. 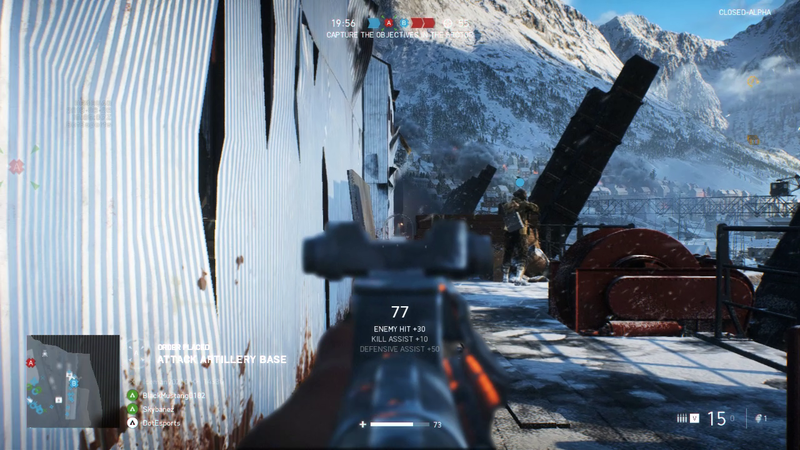 For one, there's some significant changes to gunplay in Battlefield V. Traditionally, Battlefield's guns have featured random bullet deviation, which means players can aim at a target and miss their shots because of random chance. But in BFV, DICE added fixed recoil to each weapon and significantly lowered players' starting ammunition. The result is an engaging combat experience where players can win firefights by learning how to control their guns' recoil and aim their shots carefully, making kills much more rewarding than in previous Battlefield games. There's also Battlefield V's new real-time destruction mechanic. Destroying buildings feels much more methodical and advanced during combat. When buildings start to fall apart, they can really change the course of a battle. For example, I was scoping out British troops as a Wehrmacht Assault class on a house's second floor when an explosion carved out an enormous chunk of the room I was about to enter. The walls were obliterated, the floor was partially gone, and the building creaked as if the whole structure was about to come down. So I quickly sprinted down the stairs and out the back as debris crumbled to the ground, worried that I would be crushed if I stayed inside. But most of all, DICE has made it harder to act like a lone wolf in Battlefield V. Because players spawn with only two magazines' worth of ammunition, the game encourages players to stick close to their Support teammates to receive a steady resupply between firefights. 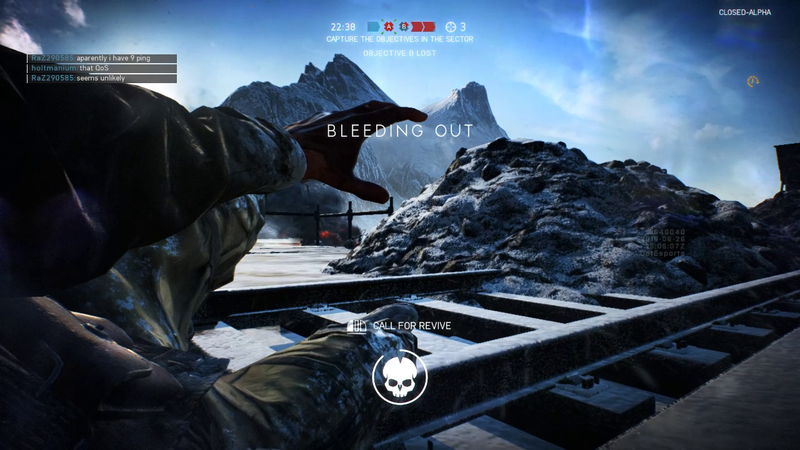 Health regeneration is a bit slower in BFV too, and it's not uncommon to remain at low health for a long period of time after receiving a serious blow. That means players need to rely on their nearby Medics for a speedy recovery if they want to hold down a control point. And then there's Battlefield V's new revive system. When players are killed, they don't immediately return to the deployment screen. Unless their squad has been wiped out or they have sustained serious injuries (like a headshot), they'll remain incapacitated and wait to be revived. Both medics and squadmates can revive downed teammates, and Battlefield V even gives players the opportunity to slow down their death by calling out for help. The whole system benefits squads that stick close, work together, and communicate with one another, and it gives multiplayer a slight co-op edge to that hasn't been seen since Battlefield: Bad Company 2 revamped the squad system in the first place. Of course, Battlefield V's closed alpha is a work-in-progress and that means these features may change before October. And there's still plenty of room for polish before the game comes out. Bugs are prominent in the closed alpha, from glitching buildings to revived players getting snagged on objects once they respawn. The current build is also woefully unoptimized, with players regularly complaining in chat about their mid- and high-range gaming rigs struggling with low framerates. And the closed alpha is (predictably) limited in scope, so Battlefield V's customization options, various class archetypes, and additional firearms remain limited for now. But as for Battlefield V's future, the closed alpha carries a lot of promise. DICE is bringing Battlefield back to its roots, but their upcoming game introduces more realism, teamwork, and skill-based combat than ever before. For fans that want a cooperative and dynamic multiplayer experience, Battlefield V has a solid start.